When you install a plugin for your website, you may see a warning that the plugin has not been tested with your version of WordPress. How WordPress Gets Not Tested Information from those plugins? The Official WordPress Plugin directory is the largest collection of free and open source WordPress plugins. When submitting a plugin, the authors need to submit a “readme” file with their plugin. This readme file is used by the plugin directory to generate the plugin page. The readme file contains a “tested up to” tag which is used to display plugin information. The plugin authors hope to keep this information up to date. It means that with each release of WordPress updates, plugin authors need to test their plugin and update the readme files for their plugin. See our article on Avoid the using of Nulled WordPress Themes & Plugins. Why Don’t Plugin Authors Update their plugin Information? 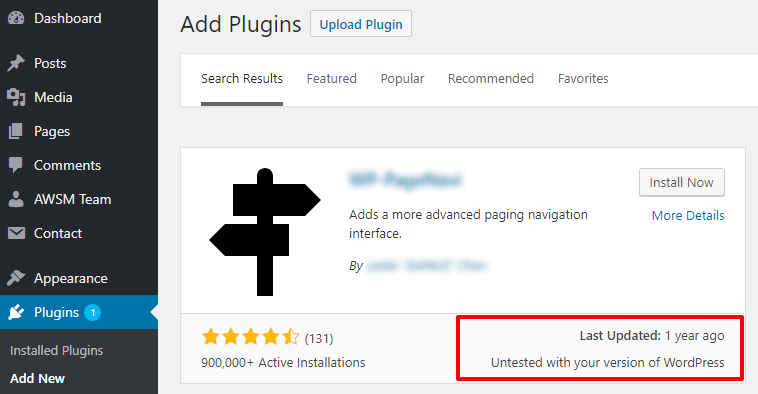 Many plugin authors do not update their redeme files even when testing their plugin on latest version of WordPress. We would like to update this information to all plugin by their authors. Remember these plugins are free, and you are not paying to download and use them. Plugin authors feel less willing to update the redeme file with each release. They are generally busy with their full time jobs or paid projects. Should You Install Plugin That Was Not Tested With Your WordPress Version? Yes, you can install it. only because a plugin author did not update their readme file its not mean that he has not tested his plugin or plugin does not work with the new release update of WordPress. If the plugin has not been updated for more than two years, it means that the plugin has been abandoned. In that case, you should not install these type plugin. It is interesting to note that many plugins that have not been updated for more than two years, but still work very well. However, you should set them at your own risk. What should we do if the plugin broken? Once again, we want to remind our users that if this is a free plugin, the plugin has provided it on the basis of the author. There is no warranty. But the question is how can you help wp community with broken plugins? Before doing anything, try installing the plugin on localhost or other demo server. See if the same error is still coming. You describe the error in the plugin support thread to answer the author or the community. If you do not get a response, then you can try reaching out to the plugin author. Plugin author contact information available on WordPress.org profile pages. If the above steps fail, you should feel free to go to the plugin page and vote for the broken plugin under the compatibility section. You can leave a positive and helpful feedback. I hope the article helped answer your questions about whether or not you should install plugin that was not tested with your WordPress version.